Summer is the perfect time for professional development, don’t you think? 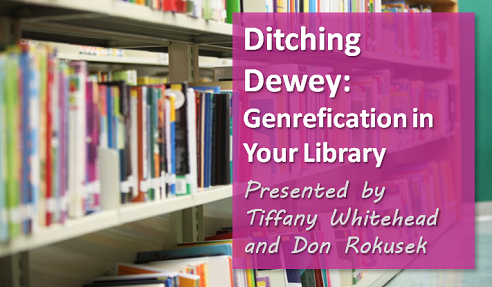 You don’t want to miss the upcoming Follet Webinar on Ditching Dewey: Genrefication in Your Library on Thursday, June 23rd at 2PM Central Time. I’m so excited to be part of this webinar as this is one of my favorite things to talk about. Although I’ve spoken on this topic numerous times over the past several years, this will be the first time that I get to share about the genrefication in my new library at Episcopal School of Baton Rouge. I will be presenting the details of my five years of success with genrefication at Central Middle School and the early progress I’ve made this summer in genrefying my second library. This webinar will walk attendees through each step of the genrefication process and give a clear overview of what it means to “Ditch Dewey.” In addition to the experiences with genrefication that I will be sharing, Don Rokusek, Program Director with Follett School Solutions, will share the resources and assistance that Follett can provide to schools and librarians during the genrefication process. Be sure to go ahead and register for the webinar now! Even if you are unable to attend the live webinar, you will receive a link to the recording. I’ve been dying to reorganize our elementary library by genre for months. This is my first year in the library after 16 years in the classroom and I trained under a wonderful (but Dewey faithful) retiring librarian who had many great things to teach me. Unfortunately, she never weeded the collection. So, last week I hit it with a vengeance … (weeding out around 1,500 books!). Now, I’m all set to begin the process of sorting by genre. The webinar was FULL of awesome ideas. The batch update is genius! I was most put- off by going into each book’s Destiny record and changing them one at a time. Now I don’t have to! Putting the nonfiction next to the fiction section is also a wonderful idea although I’m having a hard time deciding where to place certain topics. It was nice to hear you say that it’s a process that can be changed and improved over time and according to student feedback. I’m considering ditching dewy at my high school and genrfying my fiction. However, one concern I feel some teachers/admin will ask is “how is that college/career ready” since most college/universities are dewey or library of congress? What you are thoughts on this? I appreciate all you have shared on this topic already.